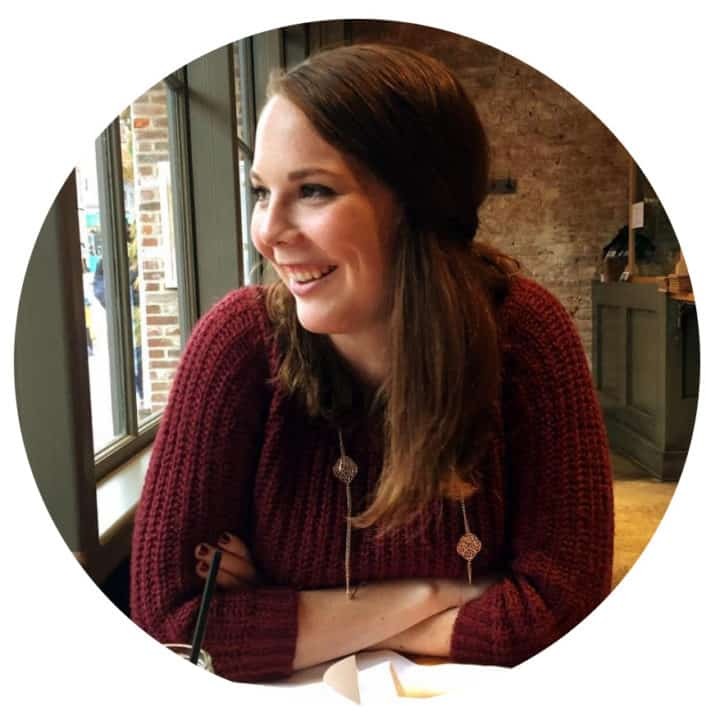 This post first appeared over at Eazy Peazy Mealz where I’m a contributor. 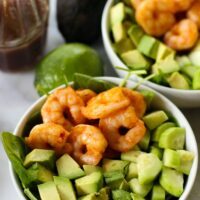 This Spicy Shrimp Salad with Lime Sesame Dressing is so refreshing and simple to throw together! 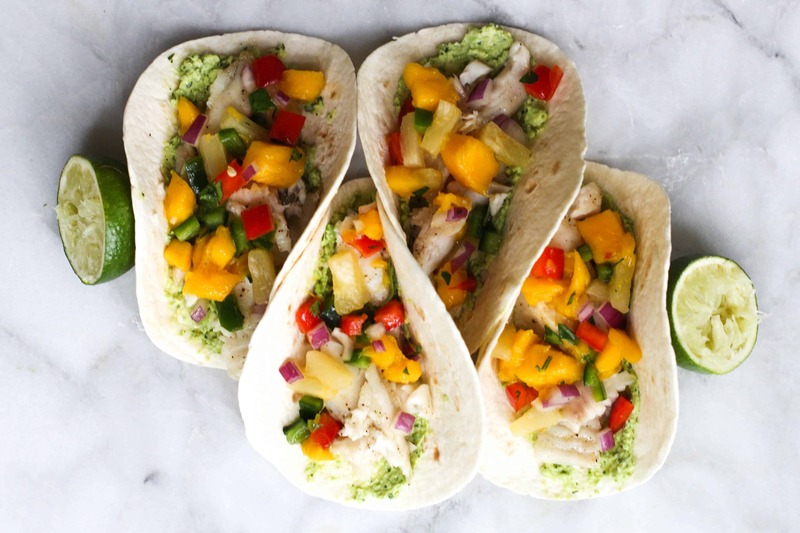 Summer is the time that eating really heavy food doesn’t sound all too appealing. This doesn’t mean you have to give up flavor! This salad is one of my favorites for this summer already. 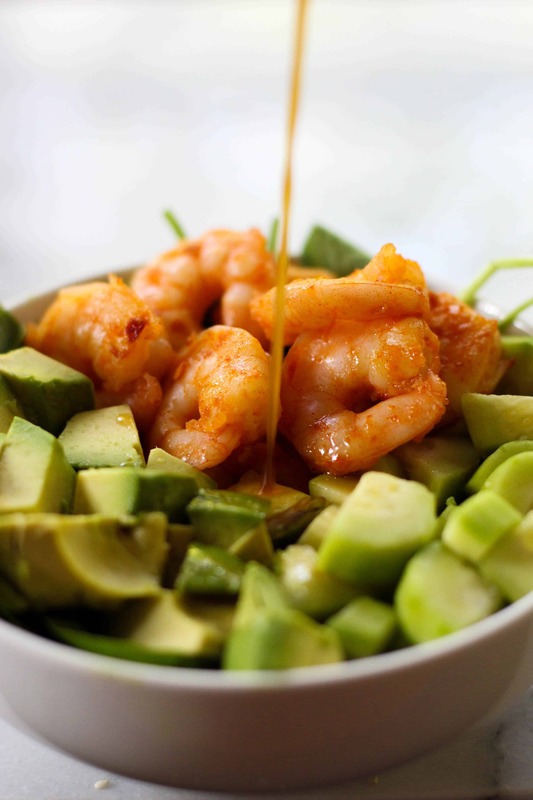 The combination of the crunchy cucumber, creamy avocado, and slight spice from the shrimp go perfectly with the light lime sesame dressing. You can also choose whatever lettuce you have to put it on like spinach or kale! 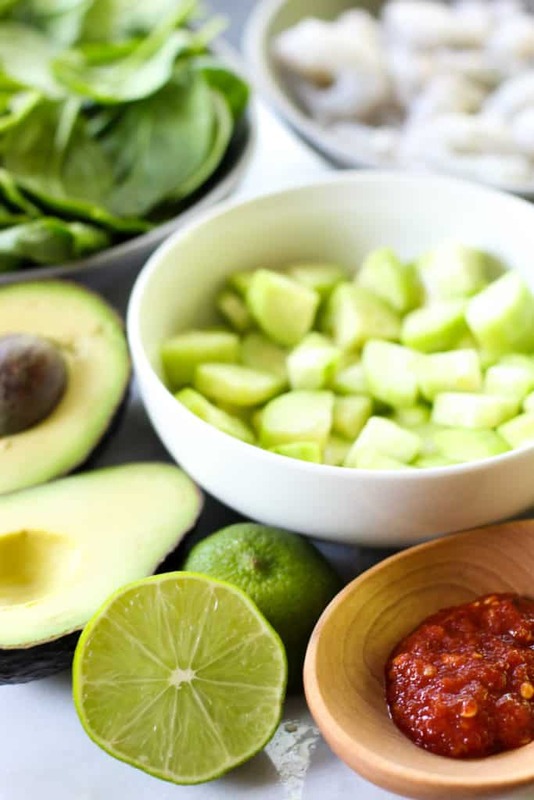 If you cut up the cucumbers and avocados into strips instead of dicing them, this combination would be great for a wrap too. The Lime Sesame Dressing is simple to make and it goes great with everything in the salad. The crisp cucumbers go great with the flavor, but my favorite is the avocados! I may or may not have made the dressing and just ate an avocado with it after trying the recipe. Another option is this Sweet Chili Sauce! It’s definitely spicy so cut down on the Sambal Oelek or whatever Asian chili sauce you choose if spicy isn’t your thing. 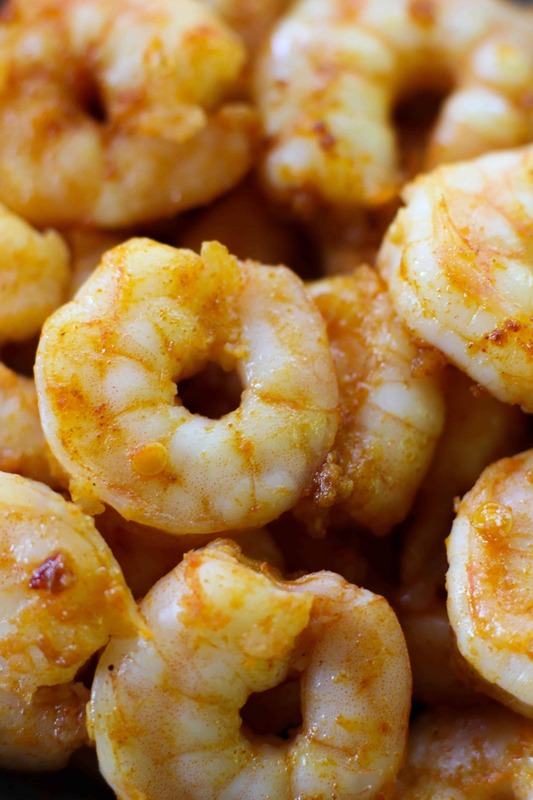 The shrimp have a great flavor to them from the combination of Sambal, paprika, and garlic. There’s enough to taste the flavors, but it isn’t spicy so kids should be able to enjoy it too! You can always take out the chili sauce and just use paprika and garlic for the flavor if you don’t have any chili sauce. It’s a great meal that doesn’t take long to make or create a lot of dishes to clean. I enjoy it because it’s also scaleable. 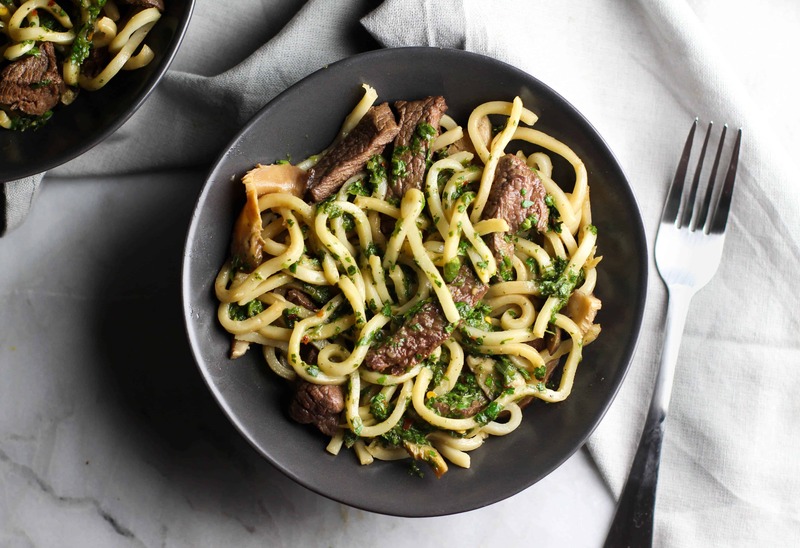 You can make it just for yourself to take to work and make your coworkers jealous or for your family on a weeknight when you’re short on time! Either way it’s a crowd-pleaser! For the Spicy Shrimp Salad: In a large saute pan over medium heat, heat olive oil with garlic until aromatic, about 2 minutes. Add in shrimp and cook until pink, about 5-7 minutes. Add in the sambal oelek, or your choice of Asian chili sauce, and paprika. Stir shrimp around to coat evenly. Let sit for 1-2 minutes then remove and place on a plate. 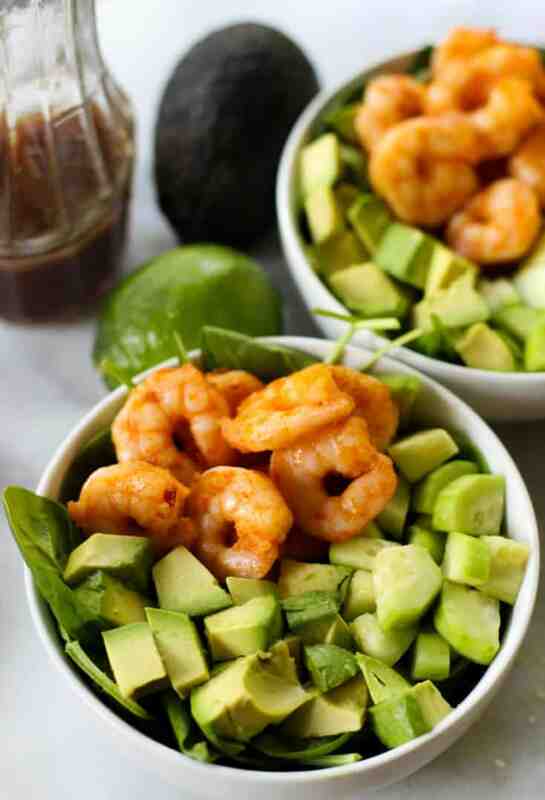 Layer 1 cup of spinach, 1/2 an avocado, 1/2 a cucumber, and a few shrimp into individual bowls. For Lime Sesame Dressing: In a mason jar or salad dressing shaker, add in lime juice, soy sauce, fish sauce, and sesame oil. Mix well. Pour some Lime Sesame Dressing over Spicy Shrimp Salad and enjoy!